CARFAX One-Owner. 2015 Honda CR-V 4D Sport Utility Black Reviews: * For young families or empty-nesters the 2015 Honda CR-V represents as good as it gets in the compact SUV segment - nice looks, thoughtful features, great ride and handling, class-leading safety, noteworthy fuel economy, terrific value. Where do you sign? Source: KBB.com * Exceptional fuel economy; abundant passenger and cargo room; nifty self-folding rear seats; appealing tech and safety features. Source: Edmunds * The Honda CR-V has a modern aerodynamic look, with sweeping lines, exciting body sculpting, and a dramatic profile. It has enough attitude and ability to get you around town and then tackle the open road and the great outdoors. The CR-V comes equipped with a 2.4-Liter i-VTEC 4-Cylinder engine with 185hp and a Continuously Variable Transmission. It has a rigid unit-body structure, coupled with taut suspension tuning, which give it impressive handling characteristics. For ultimate 4-season security, the CR-V is available with Honda's Real Time All-Wheel Drive with Intelligent Control System that smoothes out initial acceleration and can transfer up to 100% of torque to the rear wheels. The CR-V is very fuel-efficient and can get up to an EPA estimated 34 MPG Highway when in two-wheel drive. Hit the green ECON button, and the vehicle makes adjustments to its systems so they can be more efficient. Then you get feedback as you drive from Eco Assist to let you know how efficient your driving is. Honda has placed bars around the speedometer, and the longer you keep them in the green, the farther you can go on a tank of gas. The 5-passenger CR-V is extremely roomy inside, with a rear seat that accommodates adults and a proper-sized cargo area. Special attention is paid to driver comfort, with supportive front seats that flank an accommodating center console punctuated by two big cup holders. A large covered center stow bin houses USB and auxiliary inputs as well as a 12-volt power point. Available lane keeping assist and adaptive cruise control add to assisted features. Finally, its large single-piece liftgate, coupled with a significantly lower lift-over height, eases loading and unloading chores. Source: The Manufacturer SummaryLocated right off Highway 111 at Perez Rd. In the Cathedral City Auto-mall. We offer free door to door shuttle service in the valley as well as a family oriented staff and atmosphere. CARFAX One-Owner. 2016 Honda CR-V 4D Sport Utility Brown Reviews: * Exceptional fuel economy compared to other crossovers; plenty of adult-sized room in both seating rows; more cargo capacity than most rivals; rear seatbacks fold flat at the tug of a lever; appealing roster of tech and safety features. Source: EdmundsLocated right off Highway 111 at Perez Rd. In the Cathedral City Auto-mall. We offer free door to door shuttle service in the valley as well as a family oriented staff and atmosphere. CARFAX One-Owner. Recent Arrival! 2016 Honda CR-V 4D Sport Utility Gray Reviews: * Exceptional fuel economy compared to other crossovers; plenty of adult-sized room in both seating rows; more cargo capacity than most rivals; rear seatbacks fold flat at the tug of a lever; appealing roster of tech and safety features. Source: EdmundsLocated right off Highway 111 at Perez Rd. In the Cathedral City Auto-mall. We offer free door to door shuttle service in the valley as well as a family oriented staff and atmosphere. CARFAX One-Owner. Recent Arrival! 2016 Honda Accord 4D Sedan WhiteLocated right off Highway 111 at Perez Rd. In the Cathedral City Auto-mall. We offer free door to door shuttle service in the valley as well as a family oriented staff and atmosphere. Recent Arrival! 2016 Honda CR-V 4D Sport Utility Urban Reviews: * Exceptional fuel economy compared to other crossovers; plenty of adult-sized room in both seating rows; more cargo capacity than most rivals; rear seatbacks fold flat at the tug of a lever; appealing roster of tech and safety features. Source: EdmundsLocated right off Highway 111 at Perez Rd. In the Cathedral City Auto-mall. We offer free door to door shuttle service in the valley as well as a family oriented staff and atmosphere. CARFAX One-Owner. Certified. 2018 Honda Accord 4D Sedan BlackLocated right off Highway 111 at Perez Rd. In the Cathedral City Auto-mall. We offer free door to door shuttle service in the valley as well as a family oriented staff and atmosphere. CARFAX One-Owner. Recent Arrival! 2016 Honda Pilot 4D Sport Utility White Reviews: * The Pilot's interior is versatile, with roomy rear seats; no shortage of clever storage solutions; ride is smooth and compliant in most conditions; better fuel economy than rivals; all-wheel-drive system handles poor weather with ease; high-tech safety features are available on most trims. Source: EdmundsLocated right off Highway 111 at Perez Rd. In the Cathedral City Auto-mall. We offer free door to door shuttle service in the valley as well as a family oriented staff and atmosphere. CARFAX One-Owner. 2017 Honda CR-V 4D Sport Utility Gray Reviews: * Plenty of adult-sized room in both seating rows; more cargo capacity than most rivals; rear seatbacks fold flat at the tug of a lever; appealing roster of tech and safety features. Source: EdmundsLocated right off Highway 111 at Perez Rd. In the Cathedral City Auto-mall. We offer free door to door shuttle service in the valley as well as a family oriented staff and atmosphere. CARFAX One-Owner. 2018 Honda Accord 4D Sedan BlueLocated right off Highway 111 at Perez Rd. In the Cathedral City Auto-mall. We offer free door to door shuttle service in the valley as well as a family oriented staff and atmosphere. Awards: * ALG Residual Value Awards * 2017 IIHS Top Safety Pick+ (When equipped with Honda Sensing and specific headlights) * 2017 KBB.com 10 Most Awarded Brands * 2017 KBB.com Brand Image Awards2016 Kelley Blue Book Brand Image Awards are based on the Brand Watch(tm) study from Kelley Blue Book Market Intelligence. Award calculated among non-luxury shoppers. For more information, visit www.kbb.com. 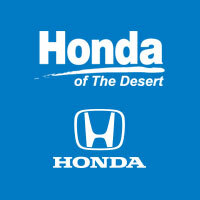 Kelley Blue Book is a registered trademark of Kelley Blue Book Co., Inc.Located right off HWY 111 in the Cathedral City Auto Center.WHY TOYOTA OF THE DESERT? At Toyota of The Desert, we only stock the very best Toyota pre-owned and Certified Pre-Owned vehicles as well as high quality, select brands from other car companies into our inventory. We have a staff of on-site buyers and regional buyers dedicated to acquiring cars and trucks that fit your particular and exclusive needs and at prices you'll love! Then, we recondition those vehicles to strict dealership and manufacturer specifications. Additionally, we work with all credit and financial situations and do our absolute best to find a vehicle that fits every individual's unique lifestyle.Our sales staff is non-commission! That means we're interested in helping to find the right vehicle for you, regardless of price. 2016 Honda CR-V 4D Sport Utility Silver Reviews: * Exceptional fuel economy compared to other crossovers; plenty of adult-sized room in both seating rows; more cargo capacity than most rivals; rear seatbacks fold flat at the tug of a lever; appealing roster of tech and safety features. Source: EdmundsLocated right off Highway 111 at Perez Rd. In the Cathedral City Auto-mall. We offer free door to door shuttle service in the valley as well as a family oriented staff and atmosphere. 2.5L I4 DOHC 16V 8-Speed Automatic 28/39 City/Highway MPG LE Toyota Camry 4D Sedan WhiteWhite Cloth.Located right off HWY 111 in the Cathedral City Auto Center.WHY TOYOTA OF THE DESERT? At Toyota of The Desert, we only stock the very best Toyota pre-owned and Certified Pre-Owned vehicles as well as high quality, select brands from other car companies into our inventory. We have a staff of on-site buyers and regional buyers dedicated to acquiring cars and trucks that fit your particular and exclusive needs and at prices you'll love! Then, we recondition those vehicles to strict dealership and manufacturer specifications. Additionally, we work with all credit and financial situations and do our absolute best to find a vehicle that fits every individual's unique lifestyle.Our sales staff is non-commission! That means we re interested in helping to find the right vehicle for you, regardless of price.